"Quick and easy shrimp recipe with a lot of flavor. Serve over a bed of rice with the juices from the pan." Heat butter in a skillet over medium heat; cook and stir garlic until fragrant, 1 minute. Add red bell pepper, green bell pepper, and parsley to garlic; cook and stir until peppers are tender, 5 to 10 minutes. 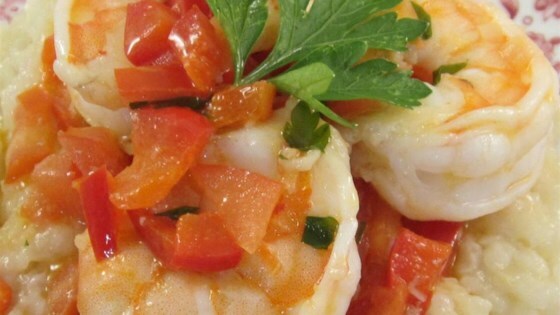 Mix shrimp and tomatoes into pepper mixture; cook until shrimp begins to warm, 2 to 3 minutes. Add lemon juice and cook until shrimp is cooked through, 5 to 10 minutes. Watch as Chef John reveals the secrets to making perfect garlic shrimp. This is a wonderful shrimp recipe that is so quick to make and has great flavor. I used only red peppers (personal preference) and served it over risotto. Thanks for sharing!